As broke states try to shed nonviolent inmates, the federal detention machine looks to expand. President Obama’s budget request for fiscal year 2013 includes cuts to everything from Medicare and Medicaid to defense and even homeland security. 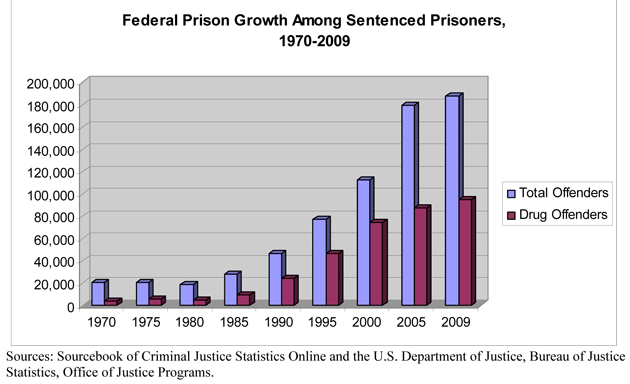 But federal prisons are among its “biggest winners,” according to an analysis by the Federal Times. The Bureau of Prisons (BOP) is seeking a 4.2 percent increase, one of the largest of any federal agency, which would bring its total budget to more than $6.9 billion. So what kind of criminals are we spending all this money to incarcerate? If you’re thinking terrorists and kidnappers, think again. According to the Sentencing Project, only 1 in 10 federal prisoners is locked up for a violent offense of any kind. More than half are drug offenders—hardly surprising, since federal prosecutions for drug offenses more than doubled between 1984 and 2005. The 1980s also produced mandatory minimum sentences, which meant we were not only sending more people to prison, we were keeping them there far longer—a perfect formula for an exploding prison population. According to Obama’s new budget, new federal prisons opening in Mississippi and West Virginia will house some 2,500 of those additional prisoners. Another 1,000 will be placed in private prisons—which now hold 18 percent of federal prisoners, far more than most state systems. The remainder of the new inmates will presumably be jammed into the existing federal prison facilities, which are already operating at 142 percent of capacity. Factored into the budget request is $44 million in savings from an expansion of programs that let prisoners shave time off their sentences by behaving well and participating in educational and vocational programs, plus a compassionate release program for seriously ill inmates who have served most of their time—a smart move for the BOP, since it would shift its costliest medical cases onto Medicaid. But there’s no guarantee that these “program offsets” will pass, especially given that Congress nixed similar proposals last year. Conspicuously absent from the Obama budget is an item the administration requested for 2011 and 2012: money to purchase and retrofit a disused Illinois prison to serve as Gitmo North, a home for detainees now held at Guantanamo Bay. Since late 2009, Obama has floated plans to buy Thomson state prison and convert it into a second supermax for Gitmo residents who were tried and convicted on American soil. But Congress has yet to come through with the cash, and it seems, at least in this budget, that the White House has thrown in the towel. If the federal government acquires Thomson, it will not be for the purpose of replacing Guantanamo, but “to meet critical federal prison capacity needs,” a Department of Justice spokesperson told TPM. In other words, we could end up with Gitmo on top of a new federal supermax like the one in Florence, Colorado—the closest thing to a torture chamber that exists in America today.